Cartman and his girlfriend, Heidi, visit SpaceX headquarters in an attempt to catch the next spaceship to Mars. 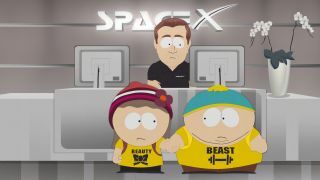 Cartman and his girlfriend, Heidi, visited SpaceX headquarters in last week's episode of "South Park," eager to get on the first crewed spaceship heading for Mars. In the episode, which aired on Comedy Central on Wednesday (Nov. 16), Cartman explains that he and his girlfriend have given up on social media and "would like to be as far away from the internet as possible" — and there's no Wi-Fi on Mars, he tells the SpaceX receptionist. However, Cartman is surprised to learn that it will be a while before humans travel to the Red Planet. However, Cartman is interested only in seeing the Mars rocket. Elon Musk holds a tour of SpaceX headquarters and shows off a futuristic mode of transportation called the Hyperloop. Earlier this year (Sept. 27), Musk announced SpaceX's reusable Interplanetary Transport System (ITS), which will combine the most powerful rocket ever built with a spaceship designed to carry at least 100 passengers. This is part of the company's plan to help establish a million-person Mars colony within the next 50 to 100 years. However, this is not exactly the time frame the characters of "South Park" are looking for — they want to go to the Red Planet now. In fact, Cartman has been thinking of going to Mars for a while. In an earlier episode ("Fort Collins," which aired Oct. 26), Cartman was caught daydreaming of a Martian colony, which featured a neon-colored roller coaster.